Frequently Asked Question categories are in bold text below. Questions are marked by a "Q:" and answers to questions are marked by "A:"
Q: I want to take one of the MEF Professional Certification exams. Which exam is the best to start with? A: Many people started with MEF-CECP because it was our first exam. However, MEF-NF was designed as a potential first exam in the series and touches several key areas, or domains. Q: What is the first MEF exam? A: The MEF-CECP exam was the first to market. The MEF-NF exam is possibly a good starting point as it covers a wider range of topics (domains) with potentially less detail. Q: How many MEF Professional Certification Exams are there? Q: What is a "Network Expert" and how is that designation achieved? Q: How long is an exam registration good for? When does it expire? A: Any exam registrations are good for up to 1 year. As a courtesy, expiration reminders are in advance of the expiration of the registration. There are no extensions to exam registrations. Q: Can I get a refund on my exam registration? A: There are no refunds on any exam registrations. Q: I took an exam last year and would like to re-take that exam. I tried to register as a "Re-take" but the system would not let me. What do I do? A: The policy stated during registration of any exams indicates "If an exam is taken and not passed, the remaining re-take exams must be taken within 6 months after which time the special re-take price offer expires and a new exam must be registered at the full exam price.” so the issue is that exam re-takes are possible within 6 months of taking the initial exam. Because it has been a year, that opportunity to utilize the special "re-take" price has expired. Q: How many re-takes are possible for an exam? A: The number of "re-takes" depends on the policy for that exam at the time. Please refer to the exam registration details for further information. Q: If someone took an older version of an exam and failed and i'm still within the 6 month re-take period but a new exam has been released, if I register for the re-take exam, will it set me up with the correct re-take version? A: Yes, the system will auto-detect the correct version for you. Q: I registered my exam 6 months ago and then a new version of the exam was released. Will I be taking the latest version of the exam? Q: I was given a free exam registration to take an exam. How long is that registration good for? A: Free exam registrations are good until the end of the specific event (ie. MEF Members Meeting, GEN15, 16, MEF 17, external events, etc) for which it was intended. Free registrations do not continue to be valid after the specific event. Exam registrations are normally not free and utilize a notification system which gives expiration notifications indicating an exam is good for one year. Under the circumstance of a complimentary free exam registration this has been identified as a discrepancy in the system and noted as an inaccuracy to be fixed. Free exam registrations terminate once the event has concluded. Q: How do I study for one of the exams? A: Exam blueprints are made available to assist in self study. Each exam has its own exam blueprint. Accessing the exam blueprints is done by visiting the exam overview page for the particular exam you are interested in. Q: Do you have training courses? Q: Who provides the best training for MEF exams? Q: I would like to study for the MEF-SDN/NFV exam. What materials are currently available? A: Each exam has its own "Exam Blueprint". For the MEF-SDN/NFV exam, the blueprint is available here: MEF-SDN/NFV Exam Blueprint. In the blueprint there are references utilized by subject matter experts to create the questions for the exam. Additional resources are, or will be, available for additional assistance in self-study and/or classroom training. Reach out to an MEF Accredited Training Provider (MEF-ATP), to view their available materials. Q: I would like to study for the MEF-NF exam. What materials are currently available? A: Each exam has its own "Exam Blueprint". For the MEF-NF exam, the blueprint is available here: MEF-NF Exam Blueprint. Based on the blueprint, references and links are provided here: MEF-NF Exam Blueprint Reference Links. In the blueprint there are references utilized by subject matter experts to create the questions for the exam. Additional resources are, or will be, available for additional assistance in self-study and/or classroom training. Reach out to an MEF Accredited Training Provider (MEF-ATP), to view their available materials. Q: I would like to study for the latest MEF-CECP exam. What materials are currently available? A: Each exam has its own "Exam Blueprint". For the MEF-CECP exam, the blueprint is available here: MEF-CECP Exam Blueprint. In the blueprint there are references utilized by subject matter experts to create the questions for the exam. Additional resources are, or will be, available for additional assistance in self-study and/or classroom training. Reach out to an MEF Accredited Training Provider (MEF-ATP), to view their available materials. Q: Can you provide a specific reference to which training provider is offering a course for the new MEF-NF exam? More MEF-ATPs are planning to offer training materials and courses on this subject. Q: Can you provide a specific reference to which training provider is offering a course for the new MEF-SDN/NFV exam? Q: I want to take the exam from my office or home. Is this possible? A: All of the exams allow remotely proctored exams. When you register for an exam you will have an option to select "remote online proctor" as your proctor to assist you with starting and securely monitor your activity while you take your exam. After your registration is complete, you will receive an email with instructions that will guide you through the process of scheduling an appointment with a proctor to assist you in starting and monitoring your exam. Q: When I choose "remote online proctor" is the cost for this service free? A: The cost for the remote online proctoring service is free per agreement based on the non-expedited service provided by our online proctoring agency. If you choose to expedite the exam within a 72 hour period, there will be an additional charge by the proctoring agency. The expedite fee is the responsibility of the person taking the exam. The MEF, MEFProCert.com and ProExamServices are not responsible for any expedite fees or any changes in the pricing by the remote online proctor agency. Q: What is the soonest I can take an exam by remote online proctor? A: The cost for the remote online proctoring service is free for the non-expedited service provided our online proctoring agency. If you wish to expedite your exam, you (student, teacher, organization etc.) are responsible to pay the extra cost of the remote online proctor service, based on the price established and published by the remote online proctor agency. The MEF, MEFProCert.com and ProExamServices are not responsible for any expedite fees or any changes in the pricing by the remote online proctor agency. Q: How do I prepare for the day of my exam? Q: Are the exams open book? A: No, the exams are not open book. Q: Can use a piece of paper and pencil for the exam? A: yes, you can use a piece of paper and pencil or pen, however all items are discarded/trashed upon completion of the exam. Q: I arrived for my scheduled time with the remote proctor and I'm having problems loading and running the remote monitoring application so they can proctor my exam. What do I do? A: The remote monitoring app is a requirement for the remote proctoring. In rare cases some people experience issues loading, running the required application. To assist in resolving the issue, please call (855) 772-8678. They also provide assistance via online chat which is available when you are connected in to the remote proctor web site. They recommend using the chat as the first method to resolve any technical issues. Q: I stepped away from my desk during my exam. I was told this was a violation and the institution and my employer were notified of a "security exception". Why? A: The rules regarding looking away, stepping away, talking to other people, looking through materials and any other suspicious behavior are strict. The exams provided by this service are high stakes and anyone suspected or known to have cheated are subject to expedited executive certification committee review. All evidence including recordings, interviews and analysis of exam results are part of an investigation. Should any evidence indicate that cheating occurred, the suspect in question is stripped of all exam current registrations, fees confiscated, and any certifications issues by the institution are voided without future opportunity to participate in certification by the institution at any time in the future. Q: I noticed someone trying to use a screen capture utility to copy questions, but the proctor noticed it and stopped his exam. A: Copying questions manually or by electronic screen capture and/or recording by any method is one of the most serious offenses and will result in immediate dismissal of an exam in progress and complete loss of any exams and/or reservations purchased and all existing certifications for life. In addition to immediate action, the individuals employer will be notified of the violation and subsequent meetings conducted as requested. Q: What happens if I cheat on an exam? A: The exams provided by this service are high stakes and anyone suspected or known to have cheated are subject to expedited executive certification committee review. All evidence including recordings, interviews and analysis of exam results are part of an investigation. Should any evidence indicate that cheating occurred, the suspect in question is stripped of all exam current registrations, fees confiscated, and any certifications issues by the institution are voided without future opportunity to participate in certification by the institution at any time in the future. Q: If I pass an exam am I certified for life? A: No. As an industry-standard practice and as technologies, services and level of knowledge changes on a daily basis, so to must the exams evolve to keep pace with the industry and required skill-sets. Each exam has its own timeline for certification expiration and re-certification requirements. Q: Will I be notified when my certification becomes expired and listed as "Inactive" on all MEF sites? A: Yes. Multiple notifications are sent to each certified individual regarding their certification and the time-frame at which time the certification will become expired. Once an individuals certification becomes expired, all use of the certification ID, logos, certificate, digital and/or printed use is required to stop. Q: I was certified 4 years ago, can I continue to use the MEF-CECP certification logo and ID assigned to me? A: No. Once your certification has expired, so does the ability to use the "Certification ID" that was assigned to you as well as all logos or otherwise designating text or images which indicate that your are currently certified. Q: What is the policy for becoming and remaining a Network Expert? A: Individuals having taken, passed and maintained an "Active" status of three MEF exams is recognized with a status of MEF Network Expert. To achieve MEF Network Expert status, without exception, three exams must be taken with a passing score recognizing them as certified in each of the given topics required to achieve MEF Network Expert status. 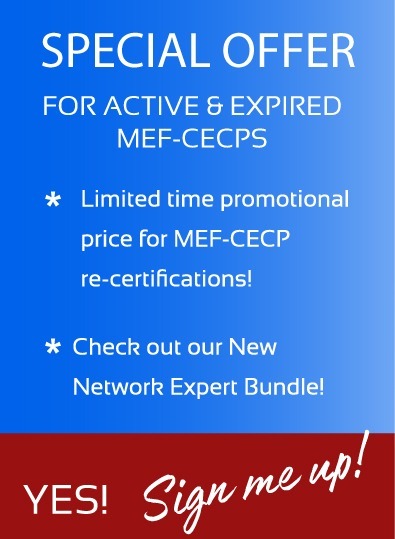 MEF Network Expert status is valid as all certifications are "Active". Q: I'm a Network Expert, but one of my three certifications will expire soon. Will I lose my Network Expert Status? A: Yes you will lose your Network Expert status, the registries will remove your status as a Network Expert, and you will lose your Network Expert certification ID until which time you re-certify the expired certifications. Q: If I lose my Network Expert Status because I do not re-certify my expired certification, will I lose my certification ID number which shows my unique standing among all Network Experts? A: Yes. You will lose your Network Expert certification ID after one year unless you re-certify the expired exam to become a Network Expert again. Q: Can I become a training provider for this service? Q: Can anyone become a training provider for the exams on MEFProCERT.com? A: No. There are requirements to accreditation as an Accredited Training Provider. As such there are requirements, guidelines and an auditing of defined parameters on an annual basis or as needed.